(CHRIS) but they kept sending us to new booths and kept giving us more forms to fill out. We had to fill out the regular entry form, car driving form, car insurance form, camera serial number form, contagious diseases form, favorite rugby team form, sexual preference form, stolen hippo form and finally, the pretentious Marxian form of ice cream, firearms, and laxatives. When we got thru, we had to change money – the US dollar gets 36 Z$. It was 11 a year ago. 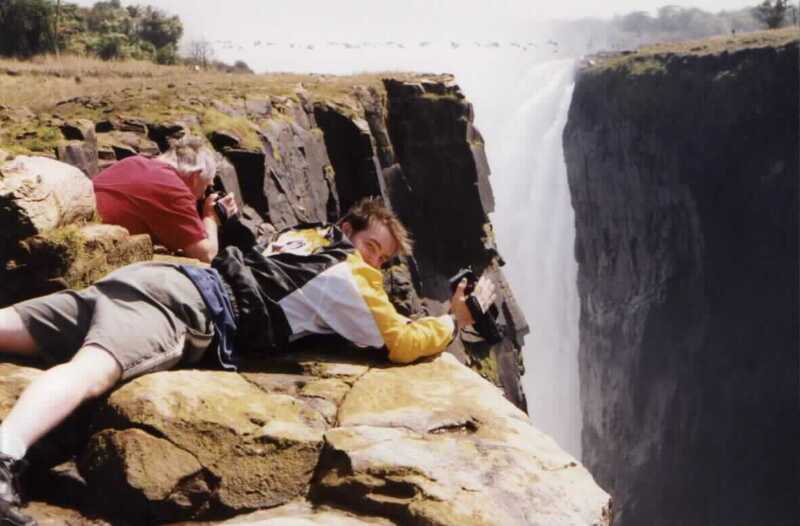 Then, after a short drive to the town of Victoria Falls, we had to exit our car while armed soldiers searched thru our stuff. In fairness, they were very polite and the search was pretty quick. There were about 16 overlooks along the misty trail. 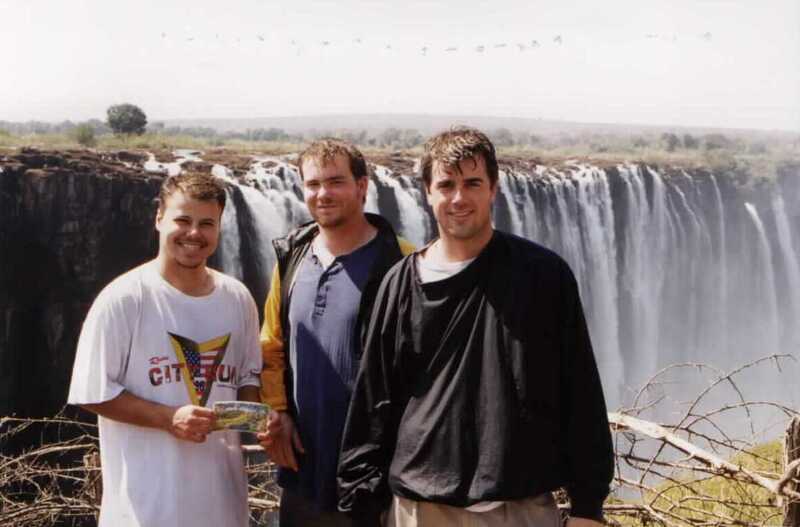 The 1st ones showed us the Zambezi River at the top and a statue of Dr. Livingstone I Presume. 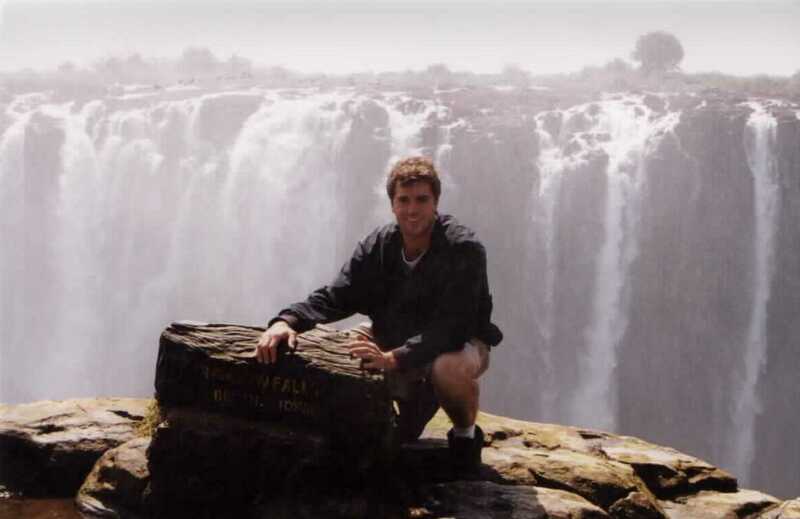 He discovered the Falls in 18 something and named them for his queen. The gorge was very deep and mistiky. Rainbows darted in and out of the soaking mist. Paul tried to catch one the whole time, but was unsuccessful until right before we left the park 2.5 hours after we got there. We saw some nature lovers enjoying a smoke of some natural weed. There were no railings, just an occasional strategically placed thorn bramble. Some places you could lay down and look over (or slip over) the wet, slippery, moss-covered edge. One place was aptly named Danger Point. We had come at the perfect time of year. 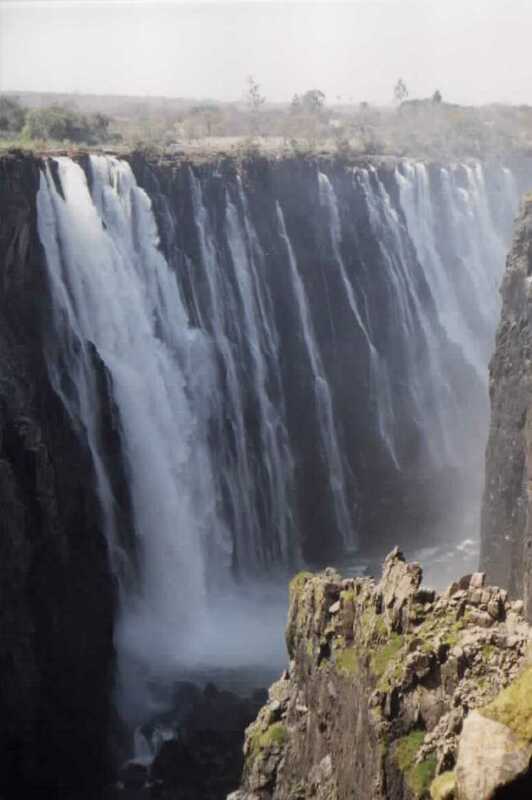 In the rainy season, the falls are so voluminous that you can’t see them thru the mist. In the dry season, they are boring because not enough water. We had the perfect medium – not too tart, not too sweet. Into our car. AND drove south towards Hwange National Park (after fending off numerous Vic Falls scam artists and getting Fish and Chips at Wimpy’s.) Sam was drooling at all the nice trinkets being sold on the roadside, so we stopped and purchased some for great values. We got giraffe salad spoons, rock carvings of hippos, and rhino-rock book ends. All for about $15US. The craftsmen were pretty nice – only slightly pushy. We gave one some Fanta and one a miraculous medal. The town of Hwange was lovely with perfectly manicured road medians and flower beds and a nice gas station where we got petrol and Sparletta Cherry Plum Soda Pop. Yum. As with many of Africa’s parks, Hwange’s gate was well inside the actual park boundaries. 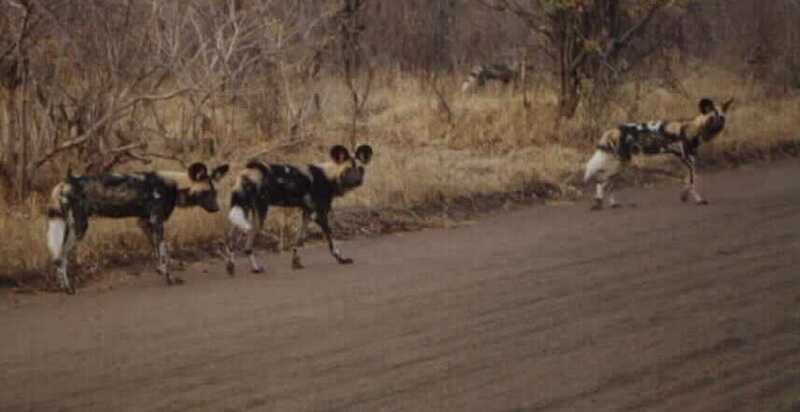 We saw many animals right off – the highlight was a pack of wild dogs right in the road. Awesome. Very rare sight. We got financially raped at the Sinamatella Gate/camp. As of August 1, N.P. prices had risen well over 800%. $40US a head to get in. $9US a head to camp. We were now well over budget and decided to skip our other Zim park in a few days time in favor of more time in Kruger, S.A. But we were here now and we hoped the park would try to live up to its hefty fees. The campground was pretty nice. We had a fireplace and counters and OK restrooms. We made a fire (we did get firewood delivered) and cooked speghetti. With bread and Chumkins beef and tomato flavor potato chips, it was dandy. Then I settled in for some star gazing, jittery at every noise from the brush (the camp had NO protection from animals.) Sam wrote in THIS HERE AFRO-LOG and Paul circulated amongst the other campers, gathering info, etc. It was a pleasant evening to be alive in Africa.